By Jon Cohen on December 11, 2012 - Nearly 1.5 million people die from tuberculosis every year, even though most cases can be cured with routine antibiotic treatments. One country's fight to get the ancient scourge under control has an unlikely hero: a simple diagnostic test. Figure 1 - TB bacteria in a GeneXpert cartridge (blue, foreground) can be detected in under two hours. 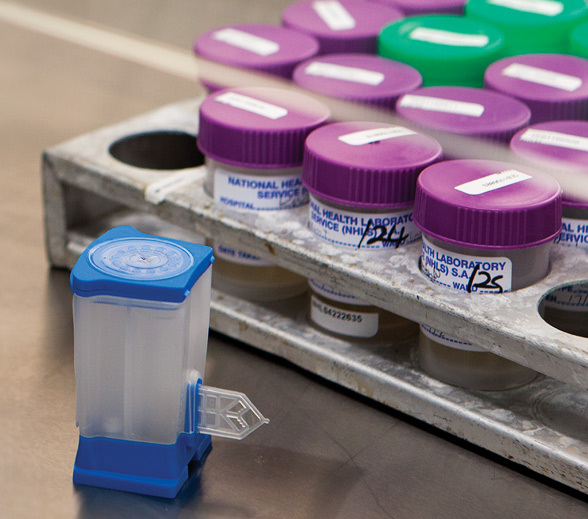 Sputum samples (purple and green caps) take weeks to culture. KwaMsane Township sits amid rolling hills in South Africa's KwaZulu-Natal Province. Drive 30 minutes to the west and elephants, giraffes, zebras, and rhinos often stroll by the side of a highway that cuts through a game park. A few kilometers to the east lie sprawling sugarcane fields, which shimmer in the subtropical sun and appear to spill into the Indian Ocean. KwaMsane is beautiful, but it has one of the world's highest rates of multidrug-resistant (MDR) tuberculosis, an often fatal form of the disease. In November 2011, Jabu Ngcobo, 25, felt a pain in her side and went to the KwaMsane clinic, which resembles a trailer park. The clinic's trailers 'called parkhomes here' surround a small covered courtyard that serves as a waiting room, with patients sitting in plastic chairs. 'I was all along thinking I had MDR TB because my two brothers and my sister had it,' says Ngcobo. 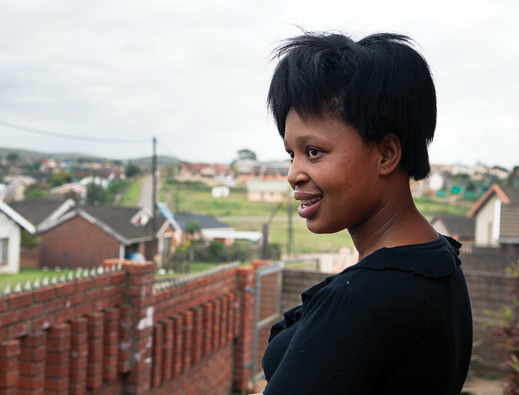 Ngcobo indeed had the drug-resistant form of TB ?and she began treatment the next day. Richard Lessells, a Scottish physician who treated her and her family members at KwaMsane clinic, notes that for Ngcobo's siblings, the months that passed without proper treatment came at a steep cost: one of her brothers suffered lung damage that will never heal. Jabu, in contrast, had no detectable levels of the bacteria a month after diagnosis, because she immediately started taking 22 pills a day as well as injections of anti-TB drugs. Ngcobo's speedy diagnosis and recovery were made possible by a machine called a GeneXpert, which sits atop a counter inside one of the trailers and resembles a high-end espresso maker. Although the advanced molecular tricks it uses to identify the DNA of M. tuberculosis would have been unimaginable outside a state-of-the-art biology lab a few years ago, the device is simple to use. A technician squirts a sputum sample from a patient into what looks like a printer cartridge and then clicks that into the machine, which performs a reaction that amplifies specific bits of M. tuberculosis DNA if they are present. Fluorescent molecules light up when they come in contact with the targeted DNA, and the machine detects the fluorescence, sending the information to a computer. The entire process takes a mere two hours. Not only can GeneXpert detect the presence of the TB-causing bacteria, but it can accurately determine whether the bacterial DNA has the mutations known to make the disease resistant to the most commonly used drug. Tuberculosis, which routinely spreads through the air, infects one-third of the human population. For almost all of those people it's harmless, and most don't even know they have been infected. And for much of the world, it is a disease mainly of historical significance. But in many poor countries, particularly in much of central and southern Africa, it remains at epidemic proportions. In 2011, an estimated 8.7 million people became sick from M. tuberculosis. Roughly 1.4 million people die of TB each year; HIV is the only infectious agent that kills more. Figure 2 - Durban TB doctor Iqbal Master welcomes the GeneXpert but says it creates many challenges. One critical reason this epidemic continues is that there's no effective and affordable way to tell who is infected. TB goes undiagnosed in some three million people each year. Some simply are never tested. Others, because of antiquated diagnostic technologies, are wrongly given a clean bill of health. Traditional diagnosis for TB relies on staining a sputum sample with dyes and then examining a slide under a microscope to look for the bacteria. This 'smear' test, developed 125 years ago, detects fewer than 60 percent of all cases and doesn't identify drug resistant strains. The more precise culture test to determine sensitivity to certain drugs takes longer, costs more, and needs to be done in a well-equipped lab so it is used sparingly. That means roughly 80 percent of the drug-resistant cases in the world go undetected, according to the World Health Organization. Together, these undiagnosed individuals represent a vast reservoir for the bacteria, including drug-resistant strains. Infection flourishes and leapfrogs through communities, devastating the most vulnerable people, such as those already weakened by HIV. A practical, quick, and powerful diagnostic tool could change that deadly dynamic. Brought to market by a public-private partnership between the University of Medicine and Dentistry of New Jersey, the Foundation for Innovative New Diagnostics in Geneva, Switzerland, and Cepheid, a manufacturer based in Sunnyvale, California, the GeneXpert TB detection machine gained approval from the WHO in December 2010. A few months later, South Africa's health minister, Aaron Motsoaledi, compared the machines to 'bazookas' in the war against TB and pledged to place them in each of the country's 52 districts. One of the most frightening aspects of TB is that humans have treated it with such indifference. All too often, patients start treatment, soon feel better, and then stop taking their pills or take them only sporadically. This creates a perfect opportunity for resistance to develop, because the bacteria with mutations that make them least susceptible to the drug will be likely to survive the incomplete treatment. 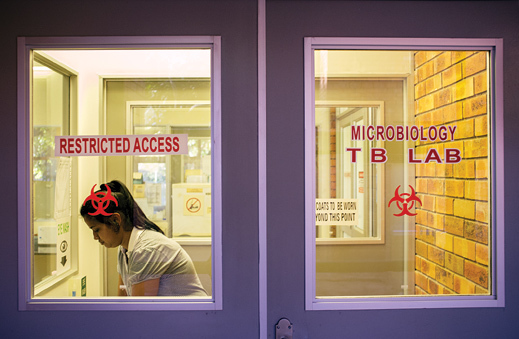 Then there is the scariest scenario of all: inappropriately diagnosed or incompletely treated MDR TB can foster 'extensively' drug-resistant (XDR) mutants that dodge two of the main classes of TB drugs. An outbreak of just such a strain was reported for the first time in 2006. And it took place in KwaZulu-Natal. Tugela Ferry, about a four-hour drive from KwaMsane Township, is a small town in the central part of the province. In August 2006, headlines around the world described the startling news that 52 of 53 TB patients who had checked into the Church of Scotland Hospital there had died on average, within 16 days of admission. Tests later revealed that they had XDR strains. The outbreak forced South Africa to look long and hard at the public-health failures that had allowed these dangerous strains to evolve and spread. Front and center was the lack of appropriate diagnostic tools. Given that even under ideal circumstances it would take more than a month to diagnose drug-resistant TB, the patients had no chance: all died before they ever learned they had a deadly form of the disease. Figure 3 - Technician Gregory Mkhize shows off the largest GeneXpert machine in Africa, at Prince Mshiyeni Memorial Hospital. It can process 48 samples at once. In the wake of Tugela Ferry, the government designated wards at King George V Hospital, a 75-year-old TB facility in Durban, solely for drug-resistant cases. The goal was both to improve treatment outcomes and to slow the spread of the disease. The hospital has seven wards with 32 beds each, including one devoted exclusively to children. There's a waiting list to get in, although Iqbal Master, the doctor who manages the program, is proud that all sick patients, and those with XDR TB, are now admitted within a few weeks of being referred; in January 2007, delays ran to four months. 'We had patients dying while on a waiting list,' he says. Patients like Nomthandzau Elizabeth Mjwara, a 48-year-old woman who has HIV and MDR TB, are grateful to secure one of the 224 beds. 'It's like I'm staying at my home,' says Mjwara, who has lived in the hospital since April. After she fell seriously ill, four months passed before she sought care, gave a sputum sample, received her TB diagnosis, and was admitted to King George V to begin treatment. Many HIV-infected patients arrive at the hospital at such an advanced stage of AIDS that even the proper TB treatment is too little, too late. Fortunately, despite the diagnostic delays, Mjwara still had enough of an immune system left to respond to the drugs. Most of the doctors and nurses who work the ward wear face masks. Master pointedly does not, in part because the patients with hearing loss rely heavily on reading lips. He has a sympathetic and wistful smile, accented by a wise man's bushy salt-and-pepper beard. 'The beard protects me from TB,' Master jokes. Although many parts of South Africa are wealthy, Durban's Prince Mshiyeni Memorial Hospital is a reminder that much of the country is still extremely poor and lacks modern medical facilities. The 1,200-bed hospital has guards at its entrance, narrow halls filled with sickly patients, and crowds of people constantly moving down the corridors. Durban doctors who do not work there often roll their eyes at the mention of its name, and recent news stories recount problems with a shortage of staff, long lines at the dispensary, security lapses (including a missing dead body), and an outbreak of bacterial infection that killed five babies. 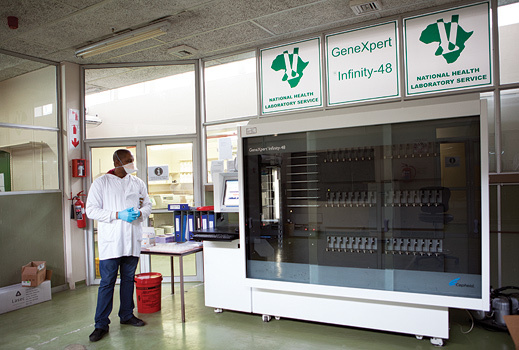 But on the grounds of this sprawling hospital is the largest GeneXpert machine in Africa. Unveiled by Health Minister Motsoaledi on World TB Day in March 2011, the mammoth machine is two meters tall and 2.5 meters long. It can process 48 cartridges at a time; they move through the contraption by means of conveyor belts and a robotic arm. But merely having the machines isn't enough. On one weekday in September, the 48-cartridge machine at Prince Mshiyeni Memorial Hospital was running only one sample. That's because the rapid scale-up of advanced TB testing has stressed the system to the buckling point. Only one supplier provides cartridges, and there already have been shortages, leading to a 'huge backlog of unprocessed specimens,' says Stephen Carpenter, clinical manager of the Don McKenzie Hospital in Botha Hills, outside Durban. GeneXpert had yet to reach his own hospital. 'We were promised that it would be rolled out all over the province and the district, but there have been all sorts of financial and logistical delays,' he says. Figure 4 - Because GeneXpert doesn't require culturing TB, it reduces risks to lab workers. Indeed, deploying GeneXpert requires a significant investment by South Africa's government. A four cartridge machine with a desktop computer sells for $17,000, and cartridges go for $9.98. Analyses show that a GeneXpert test in South Africa, including staff time and machine maintenance, costs roughly $25 per sample, versus $3 for a sputum smear and $12 to $16 for a culture. The increased cost is offset to a degree by the fact that GeneXpert incorporates resistance testing traditional drug sensitivity testing for first-line treatments costs $72 per test but all told, a paper published by PLOS ONE found, South Africa will have to spend 55 percent more per suspected TB case if it fully scales up the use of the technology as planned. The flip side is that the country will receive serious bang for its rand, because the costs of the machine are dwarfed by the expense of providing months of hospital care for TB patients. 'The diagnosis costs are a very, very small fraction of the total TB control program, and there's substantial benefit,' says Mark Nicol, a clinical microbiologist who has a joint appointment at the University of Cape Town and the government's National Health Laboratory Service. Nicol notes that poorer countries with high TB burdens will need outside help. 'But it's a price that South Africa certainly can afford,' he says. He is not alone in considering the test worthwhile. 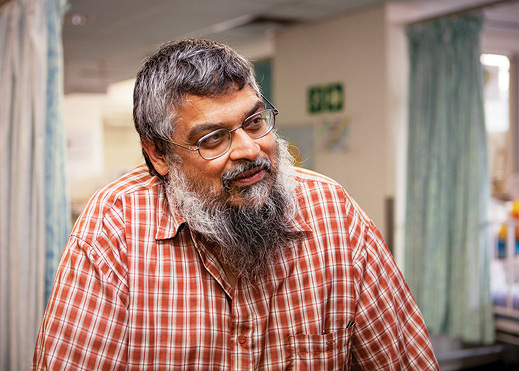 'GeneXpert has transformed the way we diagnose TB,' says Nesri Padayatchi, who previously managed the TB wards at King George V and now works across town on TB and HIV at the Centre for the AIDS Programme of Research in South Africa. But here comes the inevitable 'but': 'You can identify all these patients, but it's not addressing the central problem.' TB clinicians like Padayatchi have long dreamed of better medicines to both prevent and treat the disease. A TB vaccine was actually introduced nearly a century ago and is widely used. But so much controversy surrounds its efficacy that the United States, for one, does not generally recommend it. 'It's a wonder vaccine you wonder whether it works,' jokes Padayatchi. Eleven TB vaccines are currently in clinical trials, a reflection of the intense efforts over the past decade to rejuvenate the field, but none has yet warranted a full-scale efficacy study. The World Health Organization estimates that the earliest a vaccine could be licensed is 2020. Figure 5 - Jabu Ngcobo developed drug-resistant TB but was quickly diagnosed with GeneXpert and recovered fully.